After the game, catcher Shinya Tsuruoka said with a bitter smile that he didn’t expect it would be this through to earn a victory. 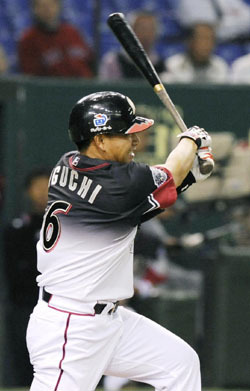 Having a rocky 0-3 start to the season, the Fighters finally notched their first win of the 2009 season by defeating the Chiba Lotte Marines 9-1 at Tokyo Dome on Tuesday. Fighters starter Kazuhito Tadano scattered seven hits, allowing just one run on a solo homer to Tadahito Iguchi over eight innings, and their offense came through late, scoring three and five runs in the seventh and eighth innings, respectively. Tadano gave up hits to the first two batters in the first inning, but got out of the jam on a triple play, started on a flyball to left, thanks to his teammates’ stellar defensive effort. Tadano (1-0), a former Cleveland Indians hurler, found his rhythm as the innings wore on and did not allow consecutive hits again. He capitalized on his fastballs, which continued to annoy the Marines batters, according to Tsuruoka. Chiba Lotte starter Yuki Karakawa was solid on the other side, too, and held the Fighters to just a run on Tomohiro Nioka’s solo shot in the fifth. But the 19-year-old didn’t receive run support. The Fighters offense put an assault on the Marines right after Karakawa left the mound, and scored three runs on Kensuke Tanaka’s RBI double in the seventh. Hokkaido Nippon Ham added five more runs in the eighth on consecutive RBI doubles by Makoto Kaneko and Tanaka. Karakawa (0-1) lasted 6 1/3 innings, yielding five hits and two earned runs and fanning five batters. 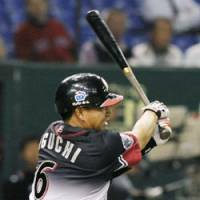 Iguchi, a former Fukuoka Daiei Hawk, belted the 150th home of his Nippon Professional Baseball career. A cleanup hitter on Tuesday, Iguchi has now hit a homer in every spot in the batting lineup. SENDAI (Kyodo) Masahiro Tanaka threw a four-hit shutout, leading the way as the unbeaten Tohoku Rakuten Golden Eagles defeated the Softbank Hawks 6-0 on Tuesday. At Seibu Dome, Takayuki Kishi limited the damage to two runs in eight solid innings against Orix to pick up his first win of the season. At Koshien Stadium, Hanshin scored four runs in the bottom of the ninth en route to the victory. At Tokyo’s Jingu Stadium, Atsushi Fujii hit a two-run homer in the fifth and drove in the tiebreaking run in the ninth, helping lift Chunichi to its fourth straight win since the season opened by beating Yakult.